Cytospora canker of conifers is caused by the fungal pathogen Cytospora kunzei (also known as Leucostoma kunzei). 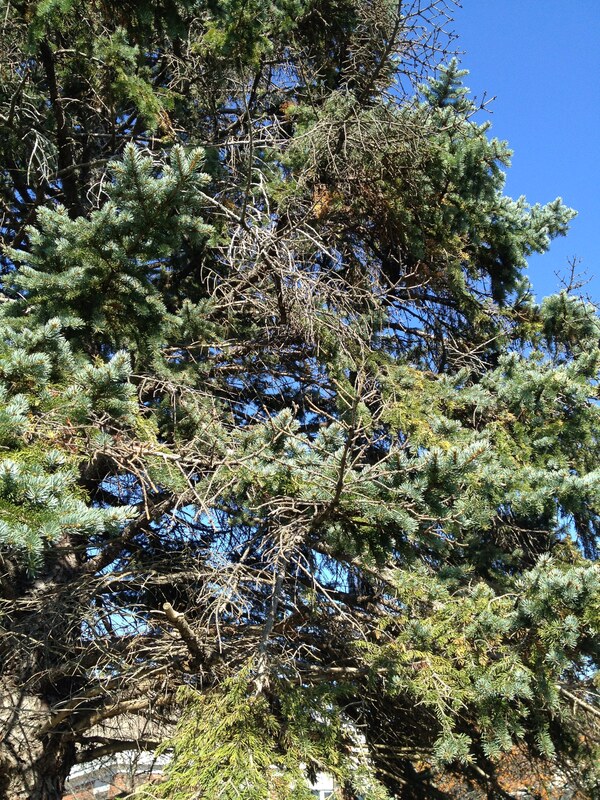 Cytospora canker is most common on blue spruce (Picea pungens) in landscape settings. In addition to spruce (Picea), many other conifers are susceptible to infection, which include: true fir (Abies), pine (Pinus), hemlock (Tsuga), Douglas-fir (Pseudotsuga) and larch (Larix). 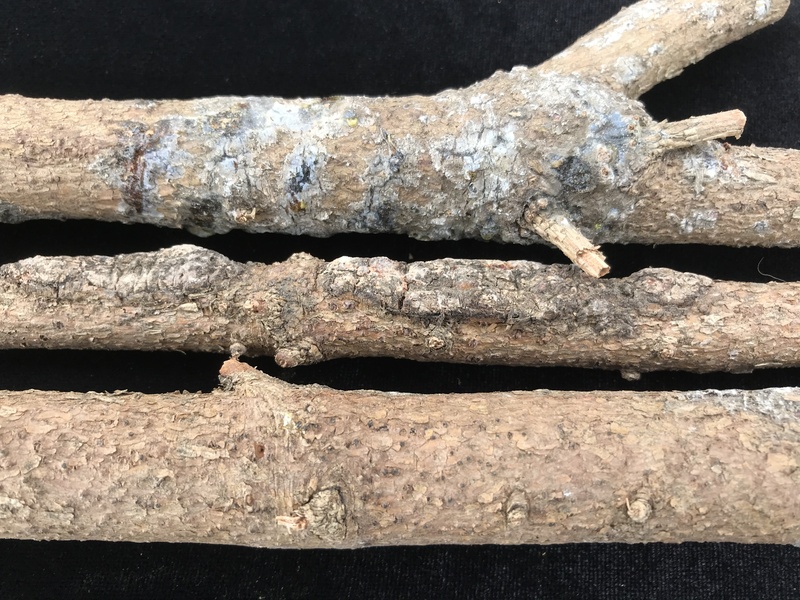 Cytospora invades both young stems and large branches, creating small, eruptive cankers. Stem cankers can expand and coalesce, killing the cambium. While the underlying sapwood is colonized, it often shows no symptoms of infection. Infections lead to stunted growth of stems and needles, yellowing of needles, early needle drop and branch dieback. 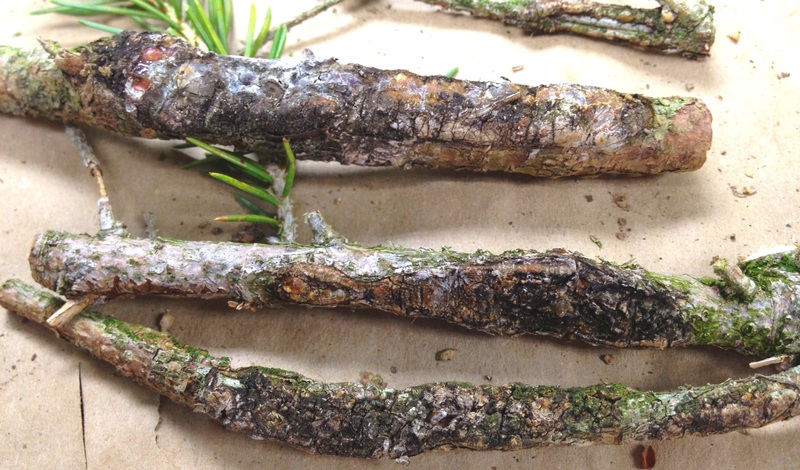 A prominent symptom of infection on spruce is the presence of hardened resin that has oozed from cankered branches. The cankers often have rough callus tissue on the margins of the infection site. Like many cankering fungi, Cytospora is an opportunistic pathogen, taking advantage of stressed hosts. Infections usually begin on older branches towards the base of the tree and gradually expand upward in the canopy. Shade and free moisture favor the pathogen and during extended periods of wet weather in late spring and early summer, Cytospora produces spores that are spread by wind and splashing rainwater. Bark wounds created by strong winds, heavy snow load, hail damage and insect feeding provide infection sites for dispersed spores. Stresses that facilitate infection include drought, needle cast infections, spider mite infestations, root compaction/severing, among other landscape stresses. Chemical control for cankering pathogens can often have mixed results. Cankering fungi live within branch and stem tissue, which may or may be symptomatic at the time of treatment. Pruning and removal of the infected stems and branches is the best management practice. However, if chemical management is desired, copper-based fungicides (copper hydroxide and copper salts of fatty and rosin acids), mancozeb, thiophanate-methyl, azoxystrobin and Phosphorous acid may have utility against the pathogen. They should be applied as new growth is developing to help protect these sensitive plant parts from becoming infected. Maintaining high tree vigor helps prevent infections from developing. Maintain a large mulch ring and provide supplemental irrigation (if possible) to trees suffering from drought stress. Avoid needles wounding of the bark to limit the number of potential infection sites for the fungus.